Delay, Early Dismissal, or No School? How to Decide? The students, faculty, and administrators at The Morgan School are well aware of the “snow day” on Tuesday, December 17th. After last week’s official snow day, it was confusing to recognize how a storm much worse did not qualify for students to go home early, let alone, stay home. Almost all school systems recognized the need to end school early. Only New Britain and Clinton students attended school all day. 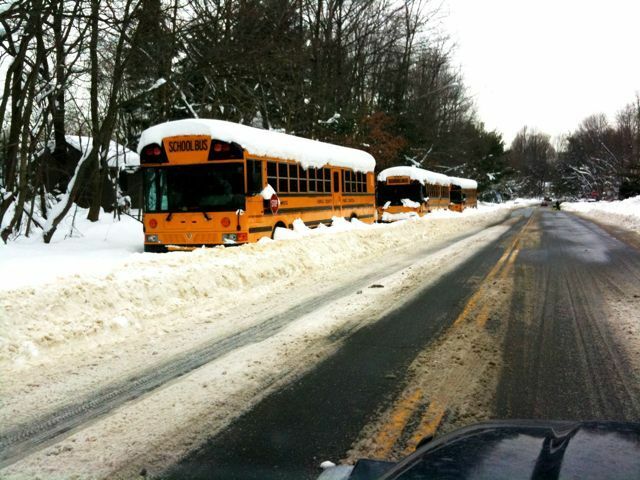 So how do superintendents across Connecticut determine delays or snow days? NBC Connecticut posted an article on Tuesday, December 17, “Superintendents Lose Sleep Over Snow-Day Decision“, with an interview of Cromwell superintendent, Dr. Paula Talty. She explained she was up at 3 a.m. trying to make a decision on what to do with the openings and closings of schools. Talty stated she believes snow days are the hardest part of her job because “It’s really a no-win situation” because she does not want to extend the school year, but the students’ safety is number one. Concerning the Clinton Public School system, our superintendent, Jack Cross, has the finally say in what happens to the students. Even though Mrs. Hagness is the principal, her opinion is only counted as an opinion. Mrs. Hagness understood the beliefs of the parents who would rather have their children safe at home, instead of venturing on the roads at 2:00 pm on Tuesday December 17th, so she gladly accepted requests for students to leave early for inclement weather. After Tuesday, I emailed Mr. Cross about the decision-making process of a snow day. Thankfully, he responded, giving me better insight in to how his decision is made. Mr. Cross explained, “As you can well imagine, making such a decision involves a number of factors and communication with numerous resources. In the end, the primary issue is safety. And despite the perception, safety was a consideration on Tuesday. So, every time I have had to make a decision a about delayed opening, early dismissal or outright closing; I consider the meteorological forecasts from multiple sources; I consult with our town’s Department of Public Works and the district’s maintenance director regarding road conditions and facility conditions, and their ability to stay on top of the conditions; I also discuss plans with the bus company and police department; and I confer with the area superintendents.” Mr. Cross does admit the snowstorm did intensify during the afternoon, but he was sure the roads were clearer than they would have been if students were to leave school early. Understanding that Mr. Cross, and all the other superintendents in Connecticut use many different variables to determine what should happen to schools during snowstorms, should help students and parents realize safety is the priority of all superintendents, despite popular perceptions. Great insight into Mr. Cross’ decision this past Tuesday.